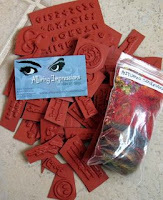 The TJNL Anniversary Celebration is almost half over...For day 15, Alluring Impressions has donated this HUGE pile of gorgeous rubber stamp images. To enter today's giveaway - click here. All entries must be received by 11:59pm EST on Tuesday, October 16. Good Luck!